Two years after the launch of Philips' first sodium lamp, GE developed a greatly improved version by changing from DC to AC operation. The Philips lamps had to be small to avoid problems of sodium migration from anode to cathode, which was overcome with AC operation. This enabled the electrode gap to be increased by a factor of six even though the power was only doubled. The result was a long positive column arc of low current density, whose efficacy is far better than the earlier negative glow discharge. The cathodes consist of tungsten coils at the centre of hemispherical bulb ends, surrounded by molybdenum anode rings. Ignition is facilitated by a third auxiliary electrode near the base, connected via a high resistance in the neck. Instead of using 2-ply sodium-resistant glass, American sodium lamps are unusual in that they use ordinary borosilicate glass with an inner protective glaze of crystalline borosilicate. 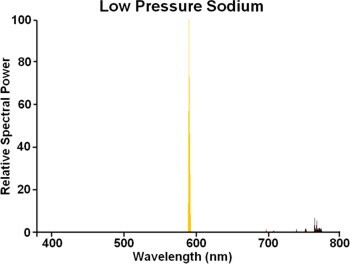 This shows excellent resistance to sodium, and can be recognised by the diffuse appearance. To protect the glass-metal seals, these are made in a lower bulb separated from the main discharge vessel by a mica plate sealed with ceramic paste. A glass tube connects the two bulbs, its diameter being narrow to reduce the mean free path of sodium atoms and their diffusion into the lower bulb. It must be operated in a heat-conserving dewar jacket, to which a draught-proof seal is provided by a stack of soft asbestos washers. The lamps were most famously used to light the Golden Gate Bridge in 1937, but low pressure sodium never gained the same popularity in the Americas as Europe, and they were finally discontinued in the 1960s as soon as GE had developed the High Pressure Sodium lamp. Manufacturer: General Electric Company, U.S.A. Factory: Nela Park, Cleveland U.S.A.
References: 1) The AC Sodium Vapour Lamp (10,000lm Na-9), G.R. Fonda and A.H. Young, General Electric Review July 1934 pp.331-337. 2) Operating Characteristics of Sodium Vapor Lamps, N.T. Gordon, General Electric Review Jul-34 pp.338-341. 4) US Patent 2,087,747, Thermionic Discharge Device, A.H.Young, General Electric USA, Filed 16th Nov 1932. 5) US Patent 2,030,380, Sodium Resistant Glass, L.Navias, General Electric USA, Filed 11th August 1934.